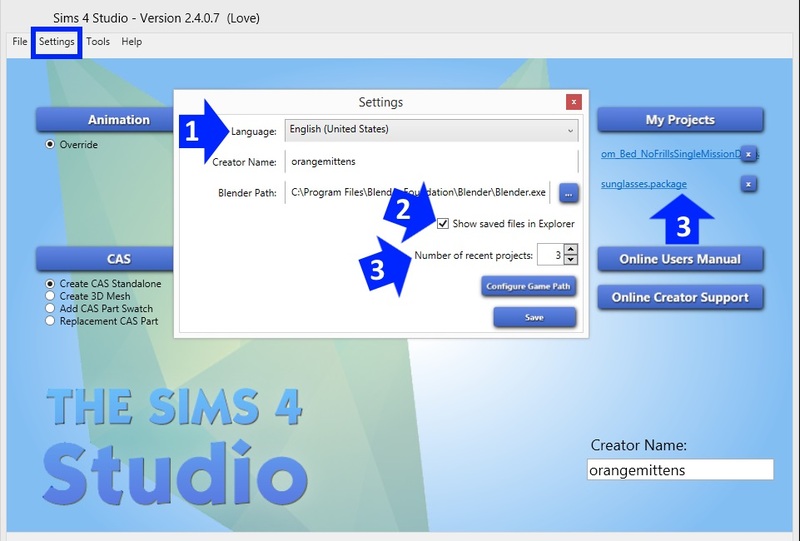 This minitutorial goes over a few features that you can utilize through Sims 4 Studio's Settings. 1. You can change the language buttons and menu items display on the Studio tab pages. 2. If there is a check mark in this box when you export an image or mesh from Studio a popup box will appear that contains the folder you saved the image or .blend into and the saved item will be highlighted so you can find it easily if that folder has other things in it. If you prefer to not have this popup appear just take the check mark out of that box and Save your settings. 3. The number here determines how many items will show up on the recent projects list that is under the My Projects button. By default it is set to 3 but you can increase it. If you don't want any recent projects to show up you can replace the 3 with a 0 and Save your settings. If you want to remove an item from the recent projects list click the small x box to the right of the item's name in the recent projects list. Not sure if it's a correct thread to ask, but where can I find how to move object in view window? I can't see close up of the boots when I move the figure a little bit down and to the side. Are there any hot keys? I tried all keys and can't figure out how to zoom in particular parts of the body. Thank you in advance. brujah, I have a mouse with working wheel (checked) but for some reason couldn't zoom in the shoes properly and when I finally screwed the position of the figure (it moved somewhere out of the viewing zone) I couldn't re-center it until I restarted the program. Thank you for the list of hot keys! 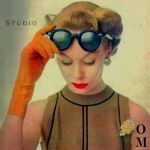 I am using the joy version of the Studio and am wondering if there is anywhere I can look for the image sizes of objects? For instance when recoloring bedding is there a list of the image sizes for the individual pieces such as pillows, top cover. folded sheet etc...? Hi dini60, sorry for the late response...I missed your post when you first posted it. You can preview the image sizes by clicking on the Warehouse tab and then clicking on the individual image lines in the left hand list there. The image will show up on the right side with the dimensions printed at the top of the right side panel. Alternatively, you can export the images to your 2D editor and it will show you the dimensions also. Hi, I'm not sure where else to ask about this. When I want to recolor a CC item and look through the "catalogue" to find the right one, I seem to only be able to view base game content. When I check "CC only", the search is completely empty. The program settings don't seem to have anything to do with this, not have I found any instructions on how to make this work, because I think it's supposed to, right? S4S is dumping my project files into C:/Users/Egw (Win10 if that matters? ), and I would MUCH rather have those files directed into /Documents/Projects (somewhere closer to my game stuff). I *never* use that Users folder, but I live in /Documents. I saw where the blender path and the other 2 paths are picked up by S4S, but if there's somewhere to change the file output path... it's eluding me. If it can be done, please tell me how? Thanks. Edit, much later, just to close this out... I watched LexiconLuthor 's video tutorial again, saw HER using different folders, so I asked how. "Dynamic pathing" (my term, I don't know if that's what it's really called). Collateral knowledge gleaned from something I watched for learning something else. Win-win! 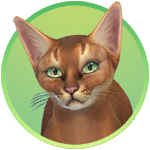 But, this excellent program is nowhere NEAR as delicate at Sims4, so now that I have a clue, I'm good... well, better, anyway. I still don't have a studio up or anything I'd put in one... but, I'm doing MUCH better than I was earlier this week regarding all things S4S. Hope everybody who celebrated Thanksgiving had a good one. I'm assuming when you say Studio is dumping your project files into an unwanted folder that you're talking about the folder Studio is saving your .package into when you clone something to start a project. If this is incorrect could you explain a little more what you're doing when this unwanted result occurs? What will cause issues is if you attempt to move a .package while it is open in Studio. 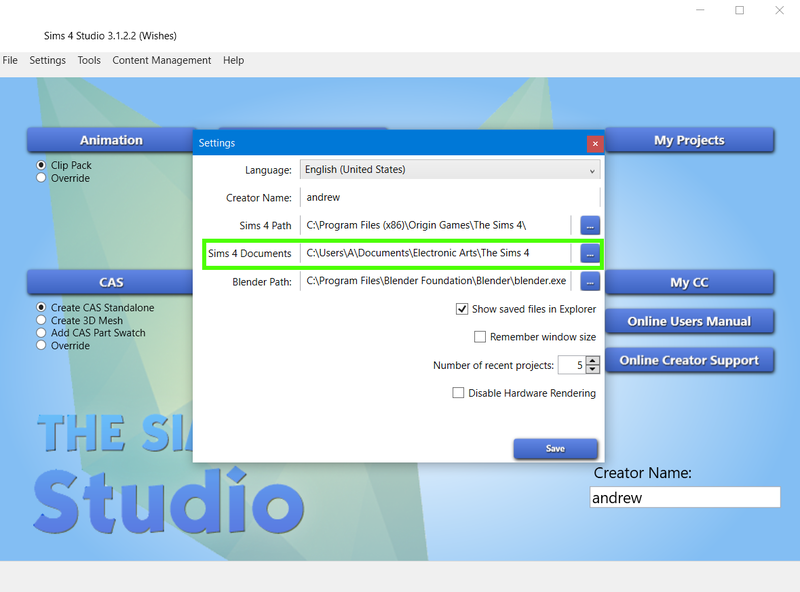 You will not notice that there's an issue immediately but when you try to save Studio will ask you to return the .package to the location where it was before it will save it. In this way Studio is much like any other program, including Windows, in that it will not allow something that it is actively using to be moved while it is still using it. First paragraph is dead on, apologies for the "negative" tone (dumping...) in my phrasing. It *was* an "unwanted result" but I wasn't ready to come to blows with S4S over it or anything. Second paragraph, bolded part is where I had lost it, but I've got it now. Last paragraph, THAT's gold... I knew there was something to pay attention to regarding saving packages but I couldn't remember what the "special" part of it was... you nailed it for me. Pretty cool you answered a question I wasn't even sure how to ask, yet, orangemittens . Thanks for all you do... to OM and *all* the wonderfully helpful people here! Me and S4S may not be new best friends yet ... but even though I'm still kinda hanging out in the frustration zone there ("getting to know you" phase), overall I am having a blast learning more about the ins & outs of package creation/editing. Cool stuff!! I haven't played the GAME in days, been too busy playing with stuff FOR the game. LOL! Hello. I'm sorry, but I have no 'build'. What should I do? Is there any way to alter the path for My Projects? I want it under a different drive and there is no way to alter it in settings. I'd post in the suggestions thread since there doesn't seem to be an option, but for some reason I'm not allowed to post there. katecat I'm guessing that you are on a Mac. The Mac version does not have build mode items yet, but the next beta will start adding them. MizoreYukii the My Projects button will always ask you which folder/package you want to open it when you click it. Do you mean the My CC button? 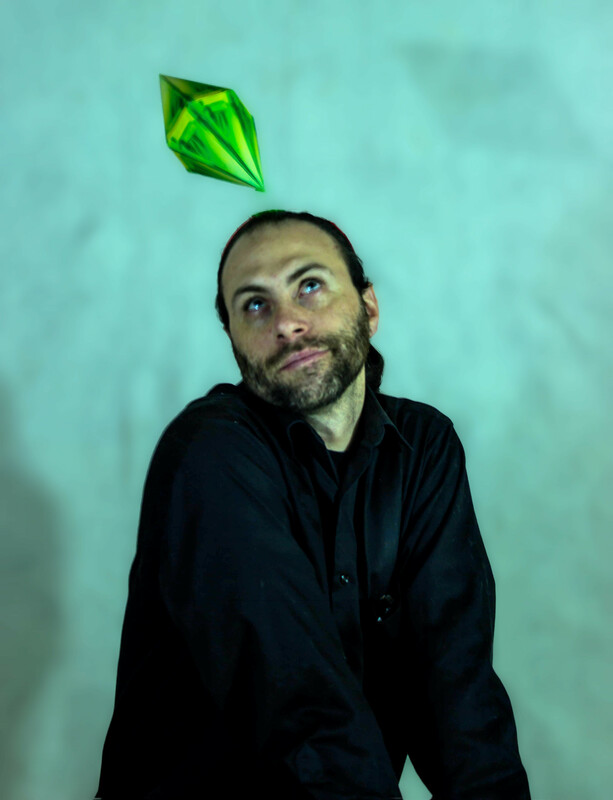 If so, Studio looks at the Sims 4 Documents folder in your settings for a Mods subfolder. You can set your Sims 4 Documents folder to any folder on any drive. andrew Sorry for the late reply, and thanks for getting back to me! 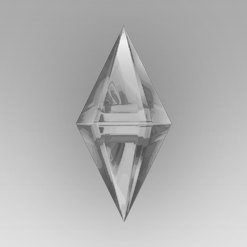 What I mean is the default location of Sims 4 Studio's documents. I want to be able to move the entire folder to a different drive and have S4s recognize it instead of making a new one. 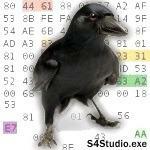 S4S is already installed on my E: drive and I'd like the documents (batch fixes, etc.) over there as well.